I specialise in English language editing of academic papers, abstracts, books, and PhD theses across the environmental and earth sciences. I worked as a UK university academic for 15+ years, have a track record of publication in high rated journals, and supervised seven doctoral students to successful completion. Click on a link below to find out more. Journal papers, single or multi-authored books, technical reports, text books. 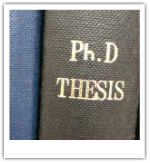 Editing and proofing of individual chapters or whole theses.